Home/How to Describe a Paper Roll Size? 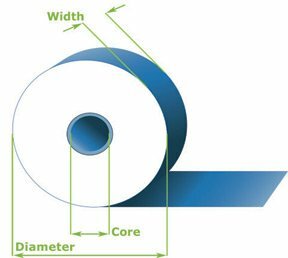 There are 3 parameters to describe a paper roll size: Width, Diameter (or Length), Core. For example, for 80mm x 70mm x 12mm thermal paper, it means the paper roll width is 80mm, the diameter is 70mm, and the core is 12 mm. In most American countries, they usually describe a paper roll by “Width x Length x Core“. For example, 3 1/8” x 230′ x 7/16″ paper roll means the paper roll width is 3 1/8”, the length is 230′, the core is 7/16”. If you want to know the relationship between a paper roll diameter and its length, please read this article.